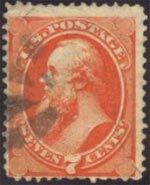 SCOTT #149 7c Stanton...used FVF cv$90. This is a perfectly good 149 with fine centering. Note the few pulled and short perfs. 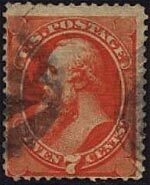 The stamp on the left was altered with new cancels and resold. It has found a new life on the RIGHT. This Says: secret mark small fault ...........Take a look at the scan. What you see is what you get. This is a handed down collection comprising of (sic) over 20 boxes. Whenever there are notations on the envelopes they will be given. Some stamps have notations on the back. Wether (sic) these notations are correct or not is your obligation to determine. The front and back of the stamps are scanned in an aid to identification. No scans have been manipulated. Also note that the Scott 149 does not have a secret mark. 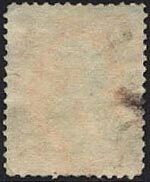 The secret mark on a 7 cent Large Banknote was not introduced until 1873 on a Scott 160.